By milhayser on August 22, 2012. The extent of Arctic sea ice undulates like a yearly sine wave—rising in October, peaking in winter, and melting all spring and summer. This September we are likely to observe the lowest of lows; Greg Laden writes "There is less sea ice in the Arctic Circle than recorded in recent history." More ice has also melted in Greenland this season, with 4 weeks still to go. Greg says, "glacial melting is both more important than one might think and also more complicated." 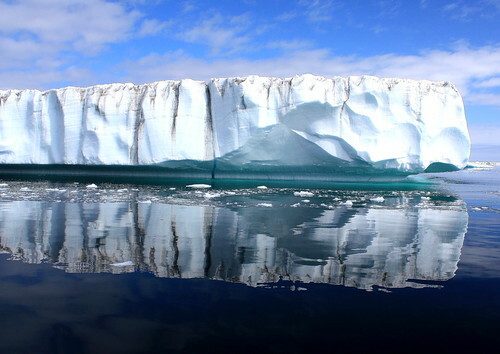 For example, the albedo of Greenland's ice sheet (the proportion of sunlight reflected back into the atmosphere) varies depending on the snowpack. "The white fresh frozen snow that falls over the winter is highly reflective," but "as it melts and gets slushy and mixes with water is has lower albedo." This is an example of a feedback mechanism, as warmth and melting allows more sunlight into the ice. Additional feedback could occur as methane, a potent greenhouse gas, is freed from polar ice sheets. Just to be clear, the current level of ice is 4.41 million sq km, and the record low is 4.28. However, we are at a record low for this date, and we have about 3 weeks before the usual time that ice starts to rebound, so a new record low is assured. Additionally, at the moment the slope of the graph isn't even looking like it is bottoming out--still looking linear. It's worth pointing out that whilst ice Extent is easiest to measure, and most useful for navigation, there are also measures of area and volume; Area - which also tries to measure ice concentration - has already blown the 2007/2011 records away. Volume will have to wait, it's published monthly. But it will be a surprise if it's not a record. As far as Extent goes, it's worth keeping in mind that irt's possible to have a couple of million km2 of 'slush-puppy' extent when Area and Volume are both within error of zero. The interesting thing will be the effect on NH weather..